In this new proposal the mirrors take center stage in the environment, it is responsible for decorating the walls in a corner and adds a touch of style. With creativity and adding personal touches you can use these accessories in a room and give it a special charm. The mirrors are a versatile and practical complement that allows decorating interiors of any style, creating thousands of compositions with them and providing them with different effects. This time the idea is to use different pieces to give life and character to a wall in a bedroom. 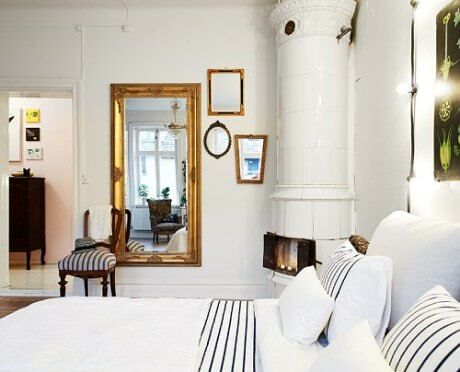 It is also a perfect choice to decorate with a collection of antique mirrors, with delicate frames or original figures. In the above picture the room has created a design with four pieces, a mirror of significant size and next three more pieces. All different shapes and frames in similar finishes, with a common denominator: the vintage air that print to the environment. Located in front of a window acquire a privileged position, capture the natural light that enters it and multiply throughout the space. In turn, it can be exploited in the bedroom to create a vanity or a comfortable dressing room. Decorate with mirrors to add appeal to a room, from a hall, a living room or bedroom, choosing each piece to detail, creativity betting that manage to create an original and unique set.